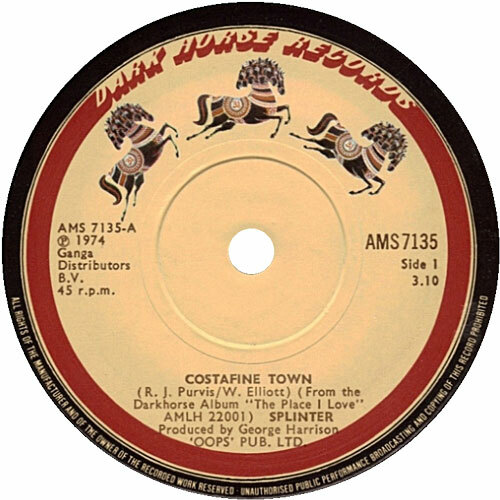 Song of the day: Splinter – "Costafine Town"
Regular blog-commenting dude side3 (Hi, sidey!) recently mentioned on my Song of the day post featuring “Junior’s Farm” that it was the second single he ever bought. Splendid. It was either my brother or me who bought that. But I’m pretty sure it was him. I definitely remember the first single he bought, but I won’t play it here because I think it might make him cringe if I mention it in public. Beatles-related Trivia: George Harrison took Splinter under his wing, signing them to his Dark Horse Records label, producing “Costafine Town” (and the album it appeared on), and also playing on it (under the pseudonym of Hari Georgeson). I think George liked Splinter. Update: I’ve just discovered that my fellow Australian blogger Stonefish (Hi, Stoneamatic!) posted “Costafine Town” last year. Excellent. You are currently browsing the archives for the Splinter category.